Whether or not it’s your first child you’re expecting or your third, preparing a nursery can be a stressful experience. There are so many fine details to hammer out and as a nesting mother or their spouse, you want to ensure everything is perfect for your little one. While designing and decorating the nursery may be a fun, exciting part of baby preparation, figuring out ways to keep it organized is another important part of the whole process. Here are some helpful tips on organizing your child’s nursery. Deciding on what area rug looks best and how to arrange the gallery wall are not the most pressing matters of the nursery. 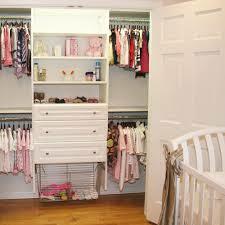 Your baby first needs a place to sleep and be changed, as well as storage for “all things baby”. Start by looking for a crib, preferably a newer model to align with safety regulations. You can learn more about baby crib safety by visiting the US Consumer Product Safety Commission website here. Not every nursery has an abundance of room to fit all baby-related items comfortably, especially if your new nursery is sharing space with a guest room or home office. This is where you have to get creative and decide what is absolutely necessary for you and your baby. An easy way to save space is to combine the dresser and changing table. Pick a dresser with lots of storage and make sure it is anchored to the wall. Add a secured changing pad to the top, and you’ve got a changing table, too. No matter if your closet is large and spacious or small and cramped, it is possible to make the most of your space when organizing. Redline Closet Systems offers customizable closet solutions to meet your needs, regardless of available space. There is even a soft close option for drawers so your little one’s fingers don’t get smashed when they are old enough to start exploring. You can also check out these closet accessories that have options for storing toys and items large and small. It’s smart to use your wall space for storage. Using StoreWALL is an easy way to store toys, lotions, diapers and more when you’re limited on space. Storing things on the wall is also a great way to keep things out of reach from your little one when they start crawling. Not only does it free up limited floor space, it can create an interesting, creative aesthetic on your nursery room walls. As an expectant mother, you most likely have more baby clothes than you know what to do with in an assortment of sizes. It’s wise to organize the clothes in three different categories: what fits now, what will fit in the future and what has already been outgrown. Keep what fits now nearby and easily accessible. What will fit in the future can be stored in the closet that is easy to get to, but out of the way of what fits now. What has already been outgrown can be placed to the side, under the crib or in the basement, ready to donate or hand down to family members or friends. Although you want the crib area to have toys and interesting decor for the baby to admire when in their crib, eliminate what you actually hang on the wall. If there are a lot of things hanging over the crib, the risk of things falling onto your baby increases. Avoid hanging more than a mobile over the crib so your baby stays safe. It’s also important to not place too many items in the crib when the baby is small for fear of suffocation. Rely on one of Garage Décor and More’s closet organization systems for storage of items your baby can play with and admire doing the day, and keep out of their crib at night. Once you have all of your nursery organization needs taken care of, you can begin the fun part: decorating and design! For any storage needs you may have for your nursery, visit garagedecorandmore.com or call (618) 789-7969 for a free consultation. One of our experts will help make the most of your space!